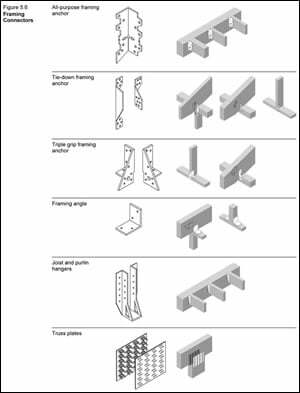 Framing connectors are proprietary products and include fastener types such as; framing anchors, framing angles, joist, purling and beam hangers, truss plates, post caps, post anchors, sill plate anchors, steel straps and nail-on steel plates. Framing connectors are often used for different reasons, such as; their ability to provide connections within prefabricated light-frame wood trusses, their ability to resist wind uplift and seismic loads, their ability to reduce the overall depth of a floor or roof assembly, or their ability to resist higher loads than traditional nailed connections. Examples of some common framing connectors are shown in Figure 5.6, below. Framing connectors are made of sheet metal and are manufactured with pre-punched holes to accept nails. Standard framing connectors are commonly manufactured using 20- or 18-gauge zinc coated sheet steel. Medium and heavy-duty framing connectors can be made from heavier zinc-coated steel, usually 12-gauge and 7-gauge, respectively. The load transfer capacity of framing connectors is related to the thickness of the sheet metal as well as the number of nails used to fasten the framing connector to the wood member. Framing connectors are suitable for most connection geometries that use dimensional lumber that is 38 mm (2″ nom.) and thicker lumber. In light-frame wood construction, framing connectors are commonly used in connections between joists and headers; rafters and plates or ridges; purlins and trusses; and studs and sill plates. Certain types of framing connectors, manufactured to fit larger wood members and carry higher loads, are also suitable for mass timber and post and beam construction. Manufacturers of the framing connectors will specify the type and number of fasteners, along with the installation procedures that are required in order to achieve the tabulated resistance(s) of the connection. The Canadian Construction Materials Centre (CCMC), Institute for Research in Construction (IRC), produce evaluation reports that document resistance values of framing connectors, which are derived from testing results.